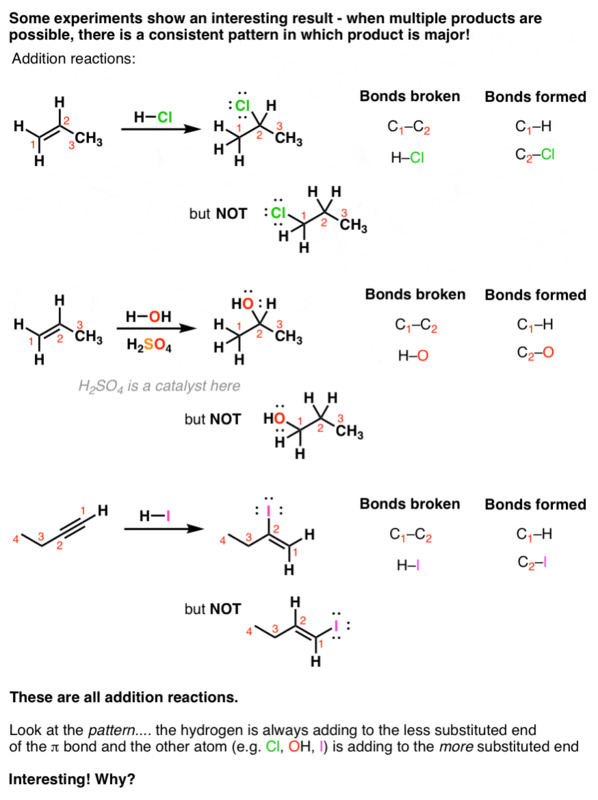 Following up on the 4 most important reactions you learn in Org 1, and the posts on acid-base and substitution reactions, here’s the third in the series: addition reactions. You’ll have to know line diagrams to get this – see the video here – and to truly grok the point of the last two images, you’ll have to understand what constitutional isomers and stereoisomers are, as well as dashes and wedges and how they show stereochemistry. But otherwise, I’m not asking you to understand why any of these reactions work at this point – just pay attention to what bonds break and what bonds form, and recognize the pattern. Here’s the first set of examples. When you take an alkene (or alkyne) and add certain types of reagents to them, you get results like this. See if you can recognize the bonds formed and broken. 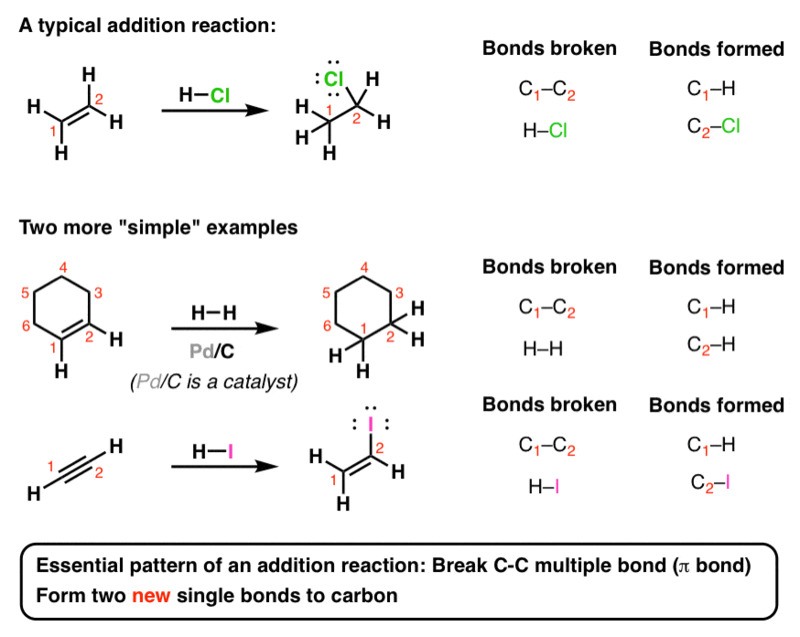 Here’s the basic pattern: break a C-C multiple bond (also called a π bond) and form two new single bonds (“σ-bonds” to carbon. 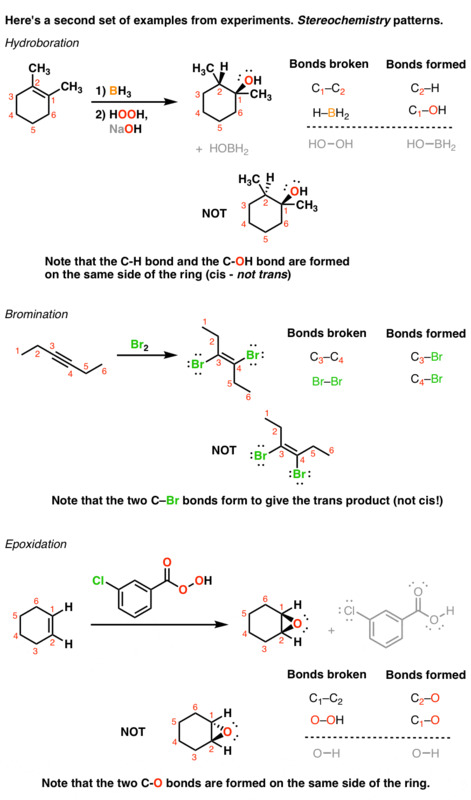 This reaction is called an “addition reaction” and it’s an extremely common type of reaction, especially in Org 1. Note that the reaction occurs only at the carbons that are a part of a multiple bond – nothing else on the molecule is affected. That’s it. Every other reaction on this page follows this pattern. Now, experiments tell us that sometimes there are additional patterns in how these addition reactions occur. For example, look at these reactions. In each case we have the possibility of forming two addition products, but only one is formed to any appreciable extent. Interesting! Later on, we’ll see this pattern repeat itself under several different circumstances. Here’s another interesting set of experiments. Look at this set of reactions. They’re also addition reactions. Here, pay attention to the wedges and dashes. In each case the reaction proceeds with a definite pattern. In the first reaction, the H and OH both add to the same side of the ring. In the second reaction, the two Br atoms each add to opposite sides of the triple bond. And in the final example the two oxygen atoms both add to the same side of the double bond. In other words, each of these reactions produces only one type of stereoisomer preferentially. – and not the other. All addition reactions follow the same pattern (break a π bond, form two single bonds). However, as we’ll see later, they do not always proceed through the same mechanism. One of the challenges with learning addition reactions will be in keeping track of which kinds of reagents lead to “regioisomers” (i.e. constitutional isomers) and which lead to “stereoisomers”. Some even lead to both! Keeping track of these traits is a completely learnable skill however, since we’ll be able to break these down further into several different patterns. More on that later! Hi. So in these addition reactions, when it comes to placement of the added H, do you determine that placement using Markovnikov’s Rule?? I think that depends on the reagent you use.